A nice alternative to a standard air conditioner is a multi-purpose heat pump, which can also provide energy efficient heat during the spring, fall and much of the spring, fall, and much of the winter. 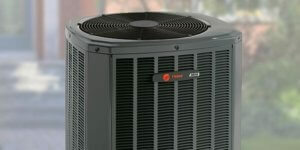 Heat pumps look very similar to an air conditioner, except that they can also be used for heating in the colder months. A heat pump works by transferring the energy of the outside air into heat or cooling for inside the home. Even in the cold Canadian winter, there is energy in the outside air. A heat pump will extract this energy and bring it into your home. Because heat pumps “redistribute” heat, rather than create their own like a furnace, they are an excellent heating source for your home. Unfortunately, they cannot be used as your only heat source in our climate. Heat pumps, generally speaking, can be used to heat your house when it’s as cold as -5 to -10 degrees Celcius. Heat pumps are quickly becoming a very popular secondary heating source for Canadian homeowners due to their high energy efficiency and because of their dual heating/cooling capabilities. Two systems in one! Toshack carries many high quality Lennox and Trane heat pumps that are perfect for heating and cooling homes in the Brockville, Cornwall, Kingston and Smiths Falls areas. Heat pumps can work with central heating systems, or can be stand-alone ductless systems that are often used with homes that have existing in-floor radiant heating or electric baseboards. See our cooling showcase for some great examples! Want to learn more about the amazing heating and cooling benefits you can get from a new high-quality heat pump? The expert staff at Toshack will help you find the perfect heat pump for your needs, and will co-ordinate the installation for you. Book your appointment today to start getting the energy-saving benefits of a Toshack heat pump.